Piedmont political leaders seem a little unsettled about Blair Park development, in Moraga Canyon. Since we all live nearby, Piedmonters and Oaklanders should hear about the upcoming city reviews. We thought that sports field plans were effectively iced – but apparently that’s not correct. The Piedmont City Council has placed Blair Park on their September 8th agenda, as part of the “EIR For Moraga Canyon Sports Fields.” There will be an environmental impact review of synthetic turf and lighting plans for Blair Park and Coaches Playfield. Piedmont and Oakland residents united to push back development earlier this year, when Piedmont’s school district considered placing portable classrooms at Blair Park. At that time, talk turned to installing retaining walls, permanent playing fields, parking lots and an overhead walkway across Moraga Avenue. Last March, Today in Montclair ran a survey to gauge opinions about playing fields and alternatives. We asked whether Blair was the answer and more than 60 percent of survey-takers were against building soccer fields there. We also asked about alternatives to solving the field shortage in the hills. Over 70 percent of respondents said that local school and college fields could be used more often – and that city-owned fields could improve their schedules, too. As the summer wraps up, it seems like what was settled is still unsettled. Some sort of slow-moving force is pushing the Blair Park fields development by the Piedmont City Council. Even without a clear funding path, there’s an important assessment scheduled right after Labor Day. We don’t have details for this latest Blair Park review, because “the staff report for this matter will be available on the city web site by Thursday, September 3, 2009.” You should be able to click here for more details. In the meantime, we know that showing up is part of the battle. Like before, we expect concerned hills residents to attend the Piedmont meeting – on Tuesday, September 8th at 7:30pm, in city chambers (map). The future of Blair Park is still at stake. In earlier meetings about Blair Park the Piedmont Mayor stated clearly that he believes he was elected with a ‘mandate’ to increase playing fields in Piedmont and he intends to do it. Many may agree that there are too few convenient playing fields for Oakland and Piedmont youth in these congested hills, but there are several identified alternative sites which, though not in Piedmont proper, are accessible and much more practical than carving a playing field out of a mountainside on an extremely narrow and already overused street. This is not a decision that impacts only Piedmont; Moraga Avenue is a major emergency access route in the Oakland Hills. It seems we will have to convince the Mayor that there is a larger environmental and neighborhood ‘mandate.’ He should pursue his fulfilling his campaign promise on more appropriate turf. This is a survey of uninformed people. Those involved in kids sports will tell you that school and college fields are ALREADY being used to the greatest extent allowed. The system for fields is well-run and efficient (and I don’t normally say that about many things). The problem isn’t a need for better scheduling. Every minute of use is being squeezed out of every available field. The problem is that there are simply not enough fields in Piedmont, Oakland, Contra Costa, the entire Bay Area. Blair “Park” is no more than a narrow vacant dirt strip with a few scraggly trees that no one uses – not even to walk their dog. Putting in green fields, perhaps with a walking trail around them, would be a huge improvement and is the best use of the land. If there are additional possibilities for fields, then those should be explored in addition to, not instead of, the Blair location. There is an overwhelming need for field space for sports and we don’t need a bunch of couch potato kids that have diabetes by the time they are 25. The only concerns seem to be NIMBYism. PS Your picture is MISLEADING. It is a view of a hillside ABOVE Moraga Blvd and to the NORTH. It has absolutely nothing to do with Blair “Park”. Blair Park is a completely flat narrow strip of dirt directly adjacent to, and south of, Moraga Blvd with 50 mph cars whizzing by. You should not be implying that ‘Blair Park” looks anything like your photo of the hillside. It does not. You should not be implying that building soccer fields would in any way affect the hillside you depict. They will not. The hillside in the picture would remain exactly as shown if the fields are build. Good point, as we didn’t control who responded from Oakland and Piedmont. However we did ask about sports participation levels, and there’s plenty of confusion about park usage and solving the constraints. P.S. 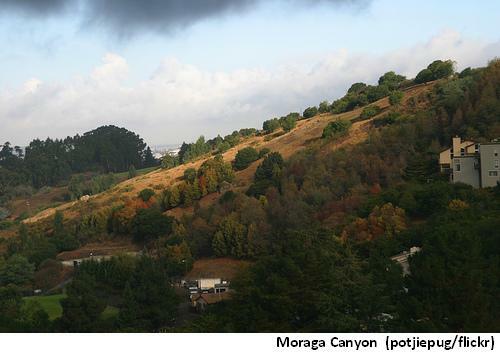 Yup, the Moraga Canyon photo (click here) was a pretty “flickr shot” which could mislead people. So I have replaced it with a funny one taken at Blair Park, when I was following some turkeys. This park is a flat area bordered by a steep hillside on one side, and super-busy Moraga Ave on the other side.